What are YOU doing to stop bullying at your school? Bullying comes in many flavors. It can be angry gangs on the playground. It can be a punch in the shoulder or repeated namecalling in the school hallways as students move between classes. It can be "cool" girls making fun of others to add to their feeling of superiority. It can be "macho" boys intimidating their gay classmates. It can be a class of students standing around a special needs student calling him "Stupid." It might be kids (or parents) waging anonymous online wars against a classmate who "rubs them the wrong way." Fortunately, the anti-bullying movement is actively engaged in a fight against this aggressive behavior in our schools and in the general public (online or not). The U.S. government has taken a stance against bullying and supported with the StopBullying.gov website and grants for fighting this problem. The most important thing is to be informed of what can be done. Stop Bullying Now - Narrative story of a bullying experience. Anti-Bullying -Kill the Silence - Students taking a stand against bullying. R.I.P. Eira Maghuyop - A memorial video that include Facebook statuses in her memory. What Kind of School Programs should I Advocate to Stop Bullying? 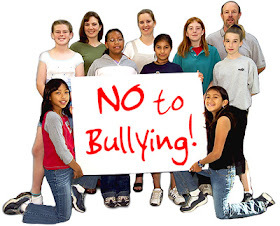 New Ways to Stop Bullying - Research based bullying prevention programs suggested by psychologists. The No Bully System - Unique program created by teachers, psychologists and lawyers. StopBullying.gov - supported by the US government. Stop Cyberbullying - Informative video created by 8th grade moviemakers. NOTE: This is based upon a posting I did on Stopping Bullying back in 2013. After talking about it in class today, I realized that it shouldn't languish in old posts. It needed a rebirth. I have added some resources. Do you have other stories of success, programs for fighting bullying or ideas about how to combat this unfairness? If so, please provide your ideas in the comments below. In life ... Indifference is not acceptable! CES School is a special Bully Free School for physically disabled children in Florida. We aim to provide care, support, and an excellent education for special child.